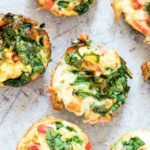 These egg cups are gluten-free, keto and convenient! Preheat oven to fan assisted 160C / 180C / 350F /gas 4. And oil a 12-hole muffin tray. Beat together the milk and eggs. Divide the egg mix equally in the muffin cups and bake for 18-20 mins or until set. Let egg cups cool for 5 mins then remove from tray and eat warm or allow to cool completely and eat cold. If you don't have large eggs, you can use 8 medium eggs. There is just 1 Freestyle Point in a serving of Baked Egg Cups.